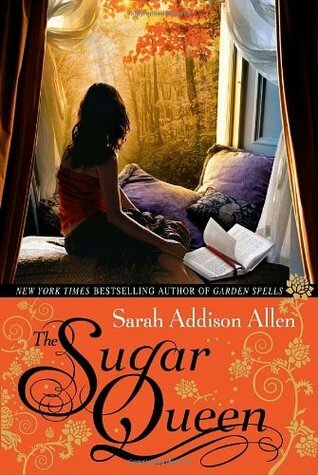 Written as magically as the first book I read by Sarah Addison Allen, I love how smoothly and naturally she weaves the supernatural into everyday events of her books. Of course, The Sugar Queen wasn't as outstanding as The Girl Who Chased the Moon, even if it was just as fluffy. I can't say for sure what, but there were just a few things about The Sugar Queen that didn't quite work out for me. Summer was tedious with the light dresses she pretended to be comfortable in while secretly sure she looked like a loaf of white bread wearing a belt. If it was one thing I had to pinpoint about The Sugar Queen that I didn't care for, it would be that I had a hard time relating with the characters, and found myself a bit frustrated with their interactions, dynamics, as well as the dysfunctional family relations presented. This is a bit frustrating since both Chloe and Josey, aside from both their worlds hinging so significantly on love and romance, are actually pretty interesting heroines on paper--in action, however, they got pretty sigh-inducing, because I'm not entirely sure I know what each of their stories was supposed to encompass. Although I DO love Chloe's strange magical ability--though I'm not sure if we could call it an ability since she doesn't consciously make it happen. Whether she liked it or not, books always appeared when she needed them. Along the lines of the characters being hard to relate with, I'm also a bit conflicted about how I like the two love stories that unfolded in this book. To call them romances seem a bit far-fetched: one felt too insta for my liking, and the other felt unresolved. And, unfortunately, while Josey and Chloe could have been interesting, our two main male characters were simply flat and... well, uninteresting. I'm not entirely sure they contributed much to the story, and I found it hard to like either of them. Jake was instantly minus fifty points because he cheated on Chloe; though I'll give him props for coming clean with her even though it took three months. Adam was just plain boring. And his whole spiel about how Jake shouldn't have even said anything to Chloe about cheating on her was a bit disagreeable. And then this brings me to something I felt a bit unhappy about. Chloe's break-up with Jake had to do with two things: Jake cheated on her, then he refused to tell her who the other woman was, which further angered her, sending her into a more chaotic spiral just to figure out this nagging piece of information she was being denied. But this isn't why I was unhappy with the situation, the characters, the book itself. I'm unhappy because I'm not sure what kind of message was being presented. Basically, aside from Josey and Jake, it seemed, almost everyone around Chloe were making little comments about how Jake needed to give Chloe space and that eventually she would come back to him... as if the two simply had a disagreement and Chloe was just overreacting. The blasé way in which Jake's father, and even Adam, were acting about what Jake did made it seem like it wasn't a big deal. But Jake cheated. And telling him that he needs to just NOT do anything, give Chloe some space, and wait for her to come back to him, because apparently everyone thinks that Chloe has nowhere else to go and no one else to go to... it made me a bit upset, truth be told. Even the books were getting on my nerves, because things titles like Finding Forgiveness, A Girl's Guide to Keeping Her Guy, and Old Love New Direction kept popping up around Chloe--as if it were her duty to fix her relationship with Jake. Then the book Madam Bovary even popped up when she was about to head out to meet with another man. The entire situation just seemed so one-sided, and again, I'm not sure what kind of message this particular love story was trying to present. Boy cheats on girl. Girl has to fix relationship? Anyway, enough about that rambling. In the end, The Sugar Queen had been entertaining enough to keep me reading, even if I was a bit frustrated by most of it. The entire Della Lee part of the story started becoming pretty predictable quite early one, though I'm going to admit, she might have been one of my favorite characters next to Helena. I felt a big giggly whenever Helena referred to Josey and her mother as "Oldgret" and "Oldsey." I found that cute in a quirky way.